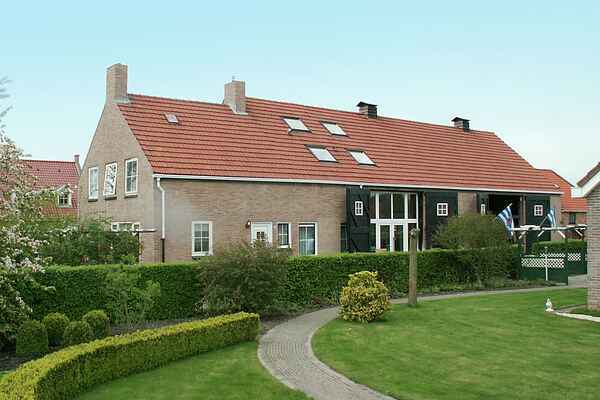 Apartment Ritthemse Pracht is located in the Zeeland village of Ritthem, near Vlissingen. You can enjoy the tranquility and nature in this part of Zeeland. The apartment is located on the first floor of a farmhouse on the outskirts of the village. And in Vlissingen you can stroll on the longest boulevard in the Netherlands, where you can almost touch the boats. Ritthemse Pracht is a comfortably furnished apartment. The cozy living room - with sloping walls - has a comfortable sitting area and open kitchen where you can cook mussels. A staircase leads to the bedroom. There's a spacious bathroom where you can indulge in bath pearls and a scrub in the tub or a quick shower and then on to the next attraction. Outside you'll find two terraces, on which for example you can have a great barbecue. The area around holiday apartment Ritthemse Pracht is very suitable for hiking or cycling. You will find several monuments and other landmarks here. In an outdoor cafe in the sun, you can sample specialties from Zeeland. Vlissingen was a land of sailors, so one afternoon you could 'dive' into maritime history in the muZEEum. Who knows what kind of sailor dreams you'll have that night!